WHEN SOPHIE BORROWED MY CAMERA ! Back in November before community service, my friends and I organised Kris Kindle and we somehow managed to keep the identities of the names we got a secret until this Monday when we gave each other the presents ! My Kris Kindle was Laura and I gave her a cute tree decoration, lots of chocolate and sweets, a scarf and reindeer antlers for the carol service and jingle bell - the presents went down brilliantly except I forgot to take a photo of the gift exchanging ! Mary got me for Kris Kindle and she gave me a Terrapotta reindeer pot that had loads of sweets in it (I have eaten all of them now.) which was basically the best thing ever because a. food and b. cute plant pots ! Last Friday I started bringing in the Travelling Tinsel to mark one week until the holidays and I had been threatening to introduce some fairy lights for a while so obviously on Monday, I had to collaborate them with the tinsel and bring them as one big embarrassment for all of my friends and one big garland of entertainment for everyone else. The cherry on top was really when Aisling decided to wrap the decoration around her neck as a scarf and the rest as they say is history because that is what the rest of the week was made up off, three types of people - one type being those who were trying on the tinsel, the second type being those counting down the days until the decoration stopped attending school and the third being those who just pulled faces and stayed out of it. As a result of our uniform being green everywhere combined with the decoration, we were described as walking Christmas trees several times. You're welcome. 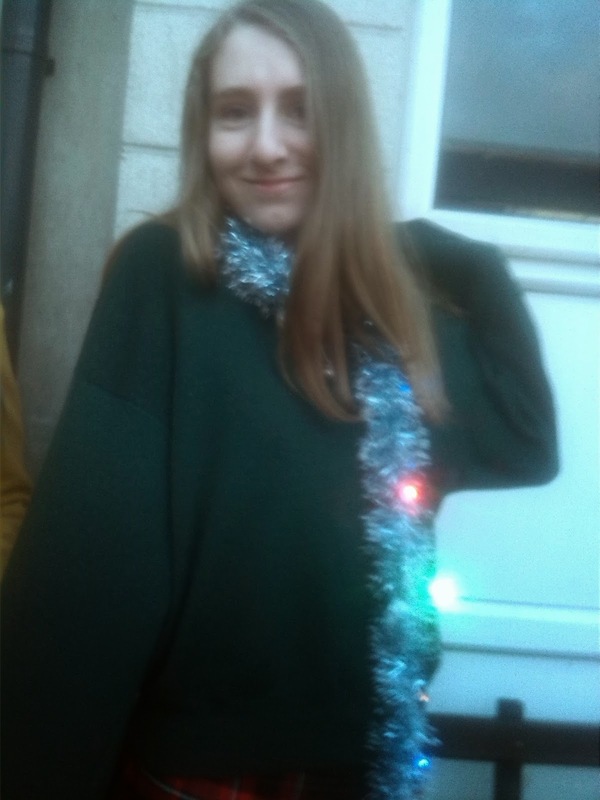 My Santa hat clips also made an appearance towards the end of the week and at that stage, I might as well have been wearing a sign saying "Hi, My name is Grace the Christmas Tree." Other Christmas ventures include the big sphere yoke generally known as "the onion" being the first thing you see walking in each morning - we won't discuss this any further, singing half the songs from Frozen in French and making a Christmas project in Scratch. Liane, who was the most embarrassed as a result of the tinsel, is the tree on the right. The tree on the left is me. Quelle surprise there ! The TY carol service on Wednesday afternoon went brilliantly - I thought the combination of the other music class singing "I'm Dreaming of a White Christmas" and the montage of photos from Transition Year so far was beautiful. It was quite funny since most of our year were wearing more festive headgear than the choirs ! Friday was the best day of the week, not only since we were getting our holidays at 1pm, but because we all were reluctantly doing the jingle bell "fun run" which involved us running in groups of eight to six locations around town in under an hour dressed like eejits with jingle bells on us and taking a group selfie at each. Perks of this included being allowed to wear our own clothes all day, preferably festive, everyone at the bench looking absolutely hilarious in their costumes and Christmas jumpers and Leah doing up my face as a reindeer ! Our team of seven were dressed extremely festively - four Christmas jumpers, one santa onsie, one tinsel and fairy lights, one reluctantly tinsel - and when we returned, we won a selection box each for more colourful team ! Everyone also got lollipops and a team won best selfie for their photo with a Garda and while we were there, one of the teams from the next class tutor came back after seven minutes with all six locations !The last break time was very funny too and Katie managed to convince me to go Christmas carolling and I went and Let It Go and Mariah Carey was sung and Deck the Halls and Santa Claus Is Coming To Town were sung fifty times and we all avoided singing Grandma Got Run Over By A Reindeer. Finally, when we returned, I found my history class in the middle of a free double and then we watched Tangled with the class next door in Maths ! Six days to Christmas !